I’m late to the party on this, but did you hear that Wal-mart is coming out with new nutritional packaging? And the company pledged to reduce sodium on packaged foods. Michelle Obama was on hand at the announcement and she gave a speech on January 20th. On the surface it sounds really great. Wal-mart is doing the obvious taking the initiative to change some packaging. But something about it irked me. I didn’t get into a lather over it, but it just rubbed me the wrong way. And it wasn’t because I’m not a Wal-mart customer. I just wish that the government could lead these packaging changes and not to go along with one company’s new policies. Anyway, if you want to read more about what happened, you can find great coverage below. What are your thoughts? Civil Eats: Walmart’s New Initiative and Our Health: More Harm Than Good? After dinner my son likes to sit on the couch next to me and play “driving a car.” He puts a cushion over our legs and we both drive. We pretend we’re firemen or policemen. He’s so active that I relish sitting next to him and snuggling. Last week we were playing car. I love sitting next to him and looking at him. I started stroking his hair. I was sort-of combing it with my fingers and I saw more of his hairline than I usually do. I saw short wisps of hair coming in, creating a “mini-fringe” hidden by his longer hair. He is getting more hair. I never even thought he had thin hair. 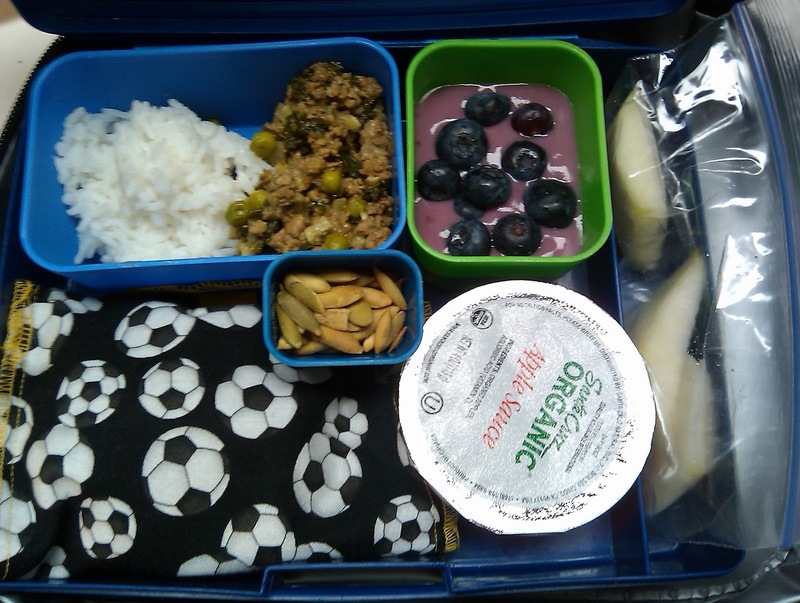 with blueberries, sliced pears,crackers in soccer ball snackTAXI, pepitas, and applesauce. My kid was eating the above while the other kids were eating ground beef, tater tots, applesauce, baby peas with snacks of yogurt and fruit. So I didn’t do too badly matching what he was eating to his little buddies’ food. I made him mini-sandwiches with the sandwich bread I made. We also made our own muffins “together,” (if you can really do that with a two-year old) but I put walnuts in them and so I couldn’t send them to daycare because of the nut ban. So I sent the last one of these that I had in the freezer. The kids at daycare were eating cod nuggets, blueberry muffins, pineapple bits, green beans, with snacks of fruit and cheese and crackers. The chicken nuggets I made were easy and fast: chopped up chicken thighs, breaded with crumbs, and dropped into a pan of oil I made a ton of them for dinner and then sent him with some leftovers. 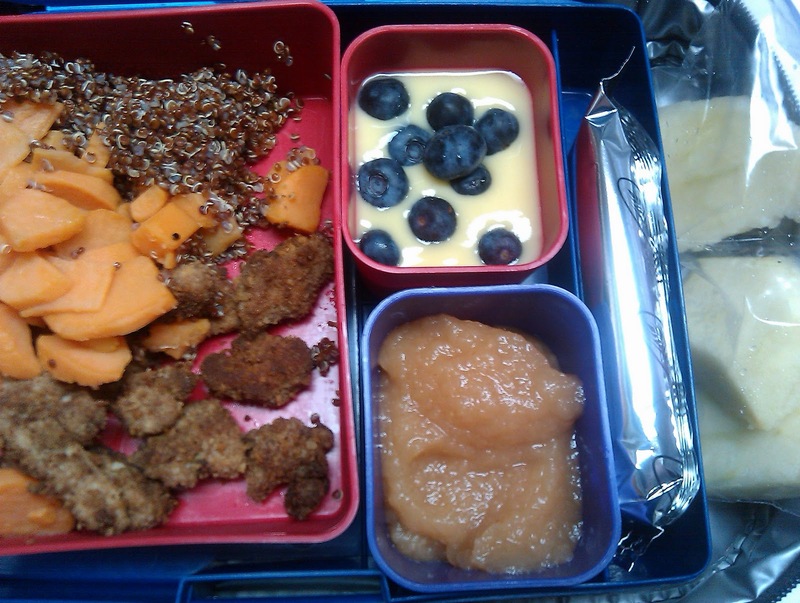 The kids at daycare had chicken nuggets, rice, diced peaches, diced carrots, with snacks of ice cream and fruit. I packed this before I left so that my husband didn’t have to work too hard in the morning. The kids at daycare were eating diced ham and beans, mandarin oranges, peas, with yogurt and bread with soynut butter as snacks. I asked my husband to take a photo of what he packed so I could share it. In comparison my son’s daycare buddies got tuna with pasta, pineapple bits, green beans with snacks of blueberry muffins and fruit. Props to my husband! When my husband has a snack, my son will go up to him and ask, “has guten?” It’s adorable and hard to watch all at the same time. 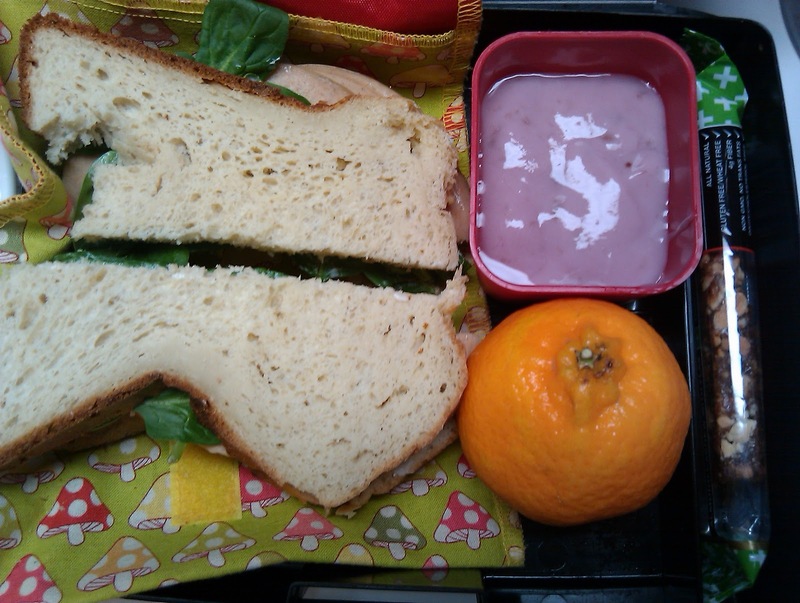 Check out these photos on flickr of 1950’s packed school lunches! Today I got back from my trip to Nashville for Blissdom. I’m going to do a recap post later…I’m just exhausted. 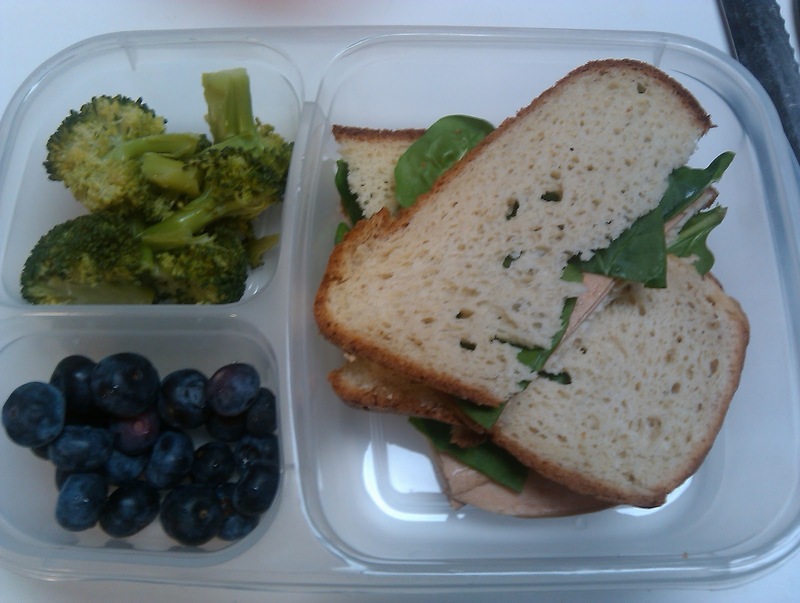 Here are my packed lunches from this week…. notice sandwiches!?! My husband unearthed the bread machine a few weeks ago and I used it with a mix that was gf, but had dairy in it and I got sick… BUT I found Bob’s Red Mill’s bread machine mix and was inspired again. I tried it on the “rapid white” setting. Later I peeked in while it was baking in the machine and thought…oh, no….it’s so small…but by the time it was done, it was perfect (next time I’ll take a picture). Sandwiches for lunch! Yes! Last weekend we talked about favorite lunches and I mentioned loving bologna sandwiches with lettuce and a little mayo. I recreated it below with organic bologna, spinach, and regular Hellman’s. Such comfort food! 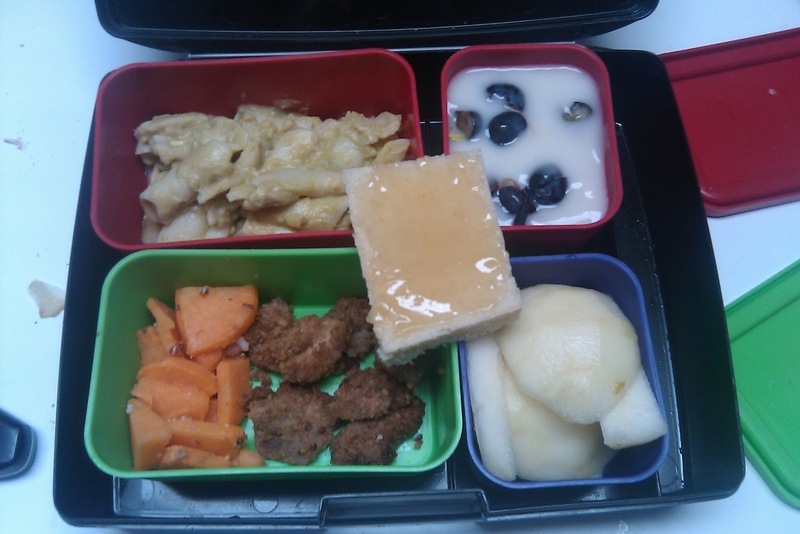 I used easylunchboxes.com here — I’m going to do a review of their product in the next couple of weeks. I really like it with sandwiches! I made a soup using the Imagine brand broccoli soup (comes in a carton) as a base, added corn pasta and chicken broth. It looks terrible in the picture, but it was good. Nice and hot for a cold day. 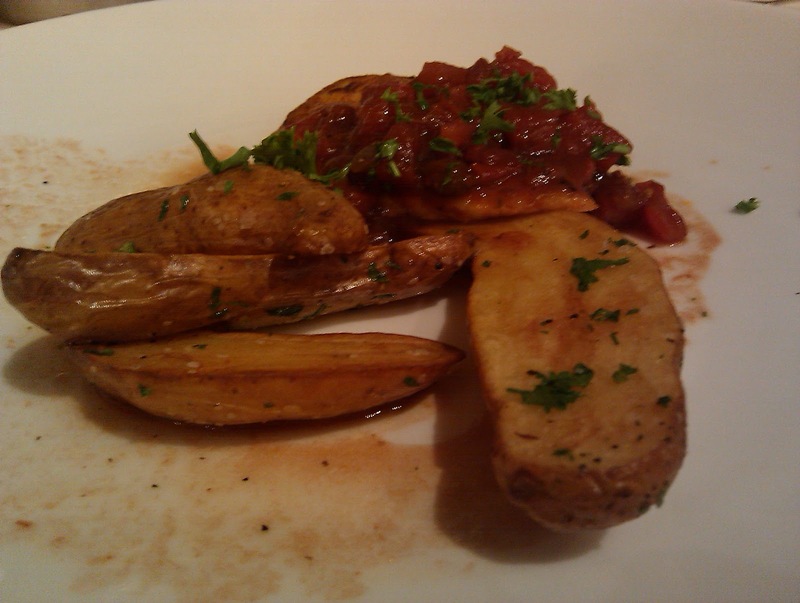 I wouldn’t serve it to guests, but I enjoyed it a lot! The other folks had pasta instead of potatoes. Two of them commented that mine looked better than theirs. I enjoyed it quite a bit. PS. My husband has lost six pounds over the past two months by eliminating gluten and dairy at dinner. He is also teaching himself how to cook and that is a fabulous thing to watch. PPS My dad has lost 20 pounds in two months by stopping eating bread and margarine (he’s not gluten free or even wheat free, just temporarily bread free). He used to eat half a loaf in a sitting (I mentioned that in my binging post). I’ve been sharing my story of eating school lunches at Blissdom and also telling people that I’m now gluten-free and dairy-free. Their reaction — stunned silence. That’s what happens when someone with a sensitive system decides to do what I did all year. Crazy. Or dumb. Or both. It’s not wheat — I’ve found some terrific products that taste just as good. It’s not cow’s milk — I got almond milk. Hello again! I just wanted to check in and say thanks for reading my blog. I have enjoyed your comments a lot. 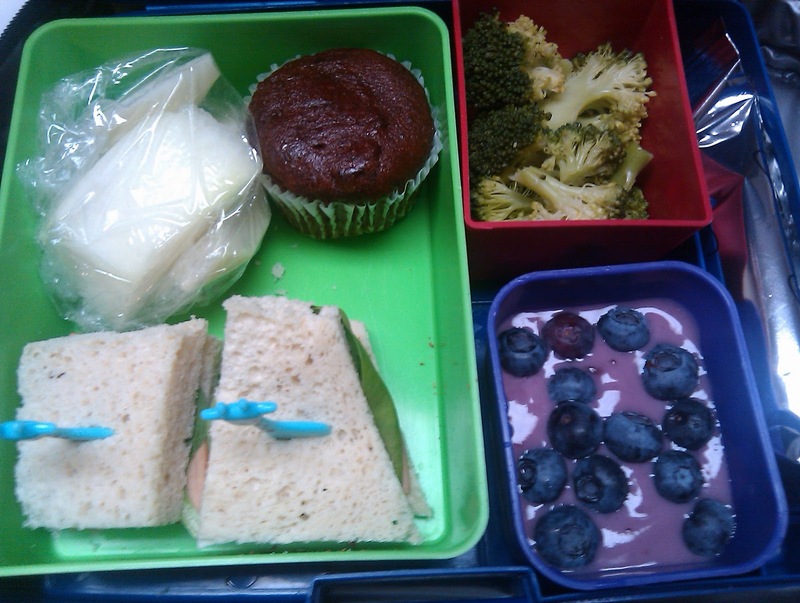 You know, I’ve realized that posting pictures of my lunches and my son’s lunches makes me feel vulnerable. I’m exposing a different part of my life by posting them. I’ve discovered over the past year that food is personal. Since my son is my world, it’s like showing part of him to you. I express my love for him through the food I feed him. 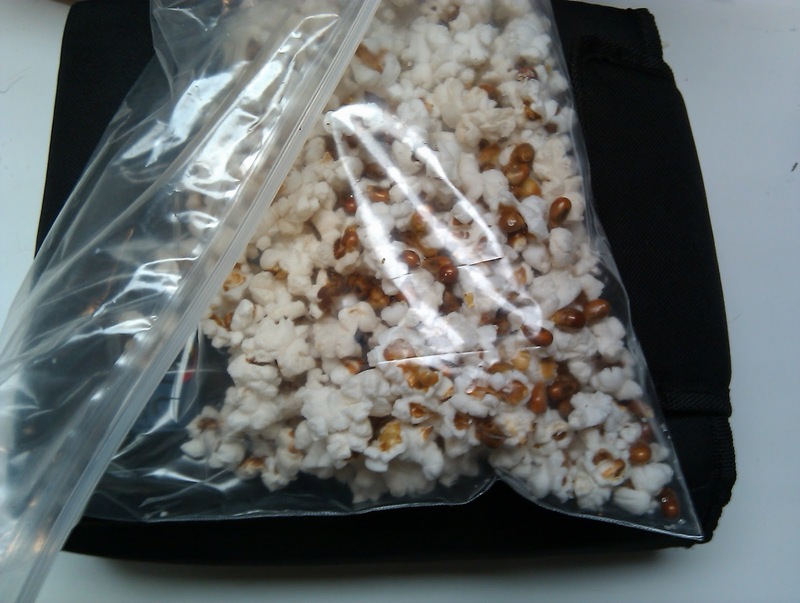 It’s not easy to pack lunches. In fact, I think that feeding kids from birth forward is a tremendous undertaking. From breastfeeding/formula to starting solids to real food for life, every transition is tough as a parent. Sometimes they won’t eat, other times you don’t have enough food ready to go and then other times you don’t have time to cook. 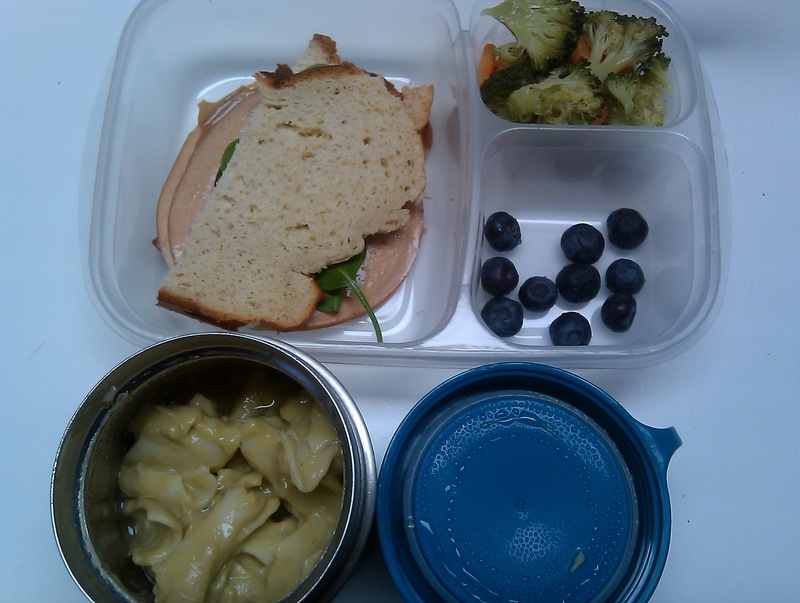 I post pics of the lunches I pack for my son so that you can see 1) I am 100% committed to good food for him 2) It takes tons of time and planning 3) Sometimes the food ain’t pretty. 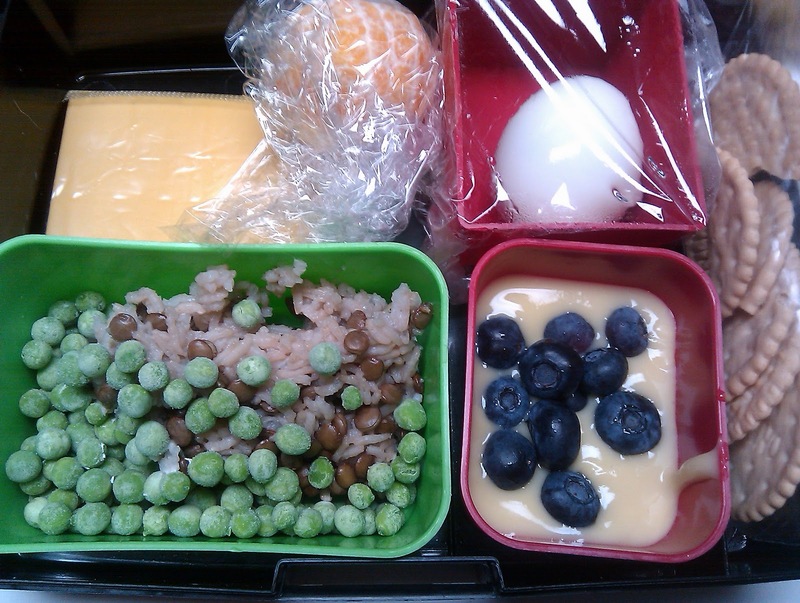 I love the bento mama blogs that I read, but I know that I will never make anything that cute! Are you reading our book club book Free For All? I hope so! I’ll post the first discussion question on February 7th. Today I’m at Blissdom in Nashville (a blogging conference). When Karen from Notes from the Cookie Jar went to Blissdom Canada in October and talked about how great it was, I was interested. But I looked up the dates of the American Blissdom and had to dismiss it because I didn’t want to miss instructional time with my students and the job I adore. But I ended up deciding to make the trip when I realized that Friday (today) is a non-attendance day the kids (it’s an institute day for teachers). I talked it over with my husband and we thought about it the advantages/disadvantages and how he would manage our son on his own (just fine, but still a consideration of ours). Ultimately, we decided I should go because I wanted to connect with more people in real life to discuss the issues that are so important to me: the food we are eating and feeding our children. It’s been incredibly valuable to chat with folks here and the presentations have rocked my world. I’m thinking about things in a new way. The conference will be inspiring new blog posts! PS. In real life, I love writing letters. PSS My sister wants me to buy school lunch again! I told her that I can’t just buy it to take a picture and toss it?! It seems wasteful and odd to do that. And I couldn’t eat it again. My body is feeling too good right now. Robyn O’Brien, a former Wall Street food industry analyst and mother, is on a mission to restore the health of the American children. She is the founder of the AllergyKids Foundation, an organization designed to protect the 1 in 3 American children with autism, allergies, ADHD and asthma. Robyn has been called “food’s Erin Brockovich” by the New York Times and one of “20 Inspiring Women to Follow on Twitter” by Forbes. In her first book, The Unhealthy Truth, Robyn brings insight, detailed analyses and compassion to her research into the impact that finances and the global food system are having on the health of the American children. Just when I thought I’d found my groove as a mother of four, life changed one morning over a plate of scrambled eggs when our youngest child had a life-threatening allergic reaction. Up until that point, I hadn’t given much thought about what went into our food, where it came from or how it is regulated, and in all candour, I had rolled my eyes at food allergies. I was a former food industry analyst, with four young children, limited time and a limited budget, and I wasn’t particularly sensitive to any of it and almost entirely ignorant about the dangers in our food supply and the sudden increase in the rates of allergies, autism, ADHD and asthma in American children. So I was stunned to learn that there had been a doubling of the peanut allergy from 1997-2002 and that according to the Centers for Disease Control, there had been a 265% increase in the rate of hospitalizations related to food allergic reactions. Since a food allergy is defined as when your body sees food proteins as foreign and launches an inflammatory response to drive out the foreign invader, I couldn’t help but ask the question: are there new and perceived “foreign”substances in our food supply? And that’s when I really started to learn some very disturbing truths. In 1994, farmers began injecting dairy cows with a genetically engineered hormone called recombinant bovine growth hormone (rBGH), which they used to increase milk production in dairy cows. And while, today, milk allergies are the most common food allergies in the United States according to CNN and the Wall Street Journal, no tests have been developed to assess whether these allergies are actually in response to the new proteins introduced in the genetic engineering process that produced rbGH. And these foreign proteins aren’t just showing up in our milk. A few years after scientists got ahold of our dairy, soy began to be genetically engineered and there was a sudden increase in the rates of soy allergies despite the fact that once again, no tests were developed to assess the allergenicity of the novel proteins created in the process. While correlation is not causation, these statistics were jaw-dropping. Yet when I approached the largest food allergy non-profit about the data, they basically had an allergic reaction to me. So with my background in finance, I pulled their financial statements in an attempt to understand why they might react this way, not only to find out who might be funding their research but also to learn why they had not highlighted the potential risks, novel proteins and novel allergens found in these recently introduced genetically engineered foods. That is when I learned of their financial relationship, and those their medical advisors, with large food and chemical corporations, with some of our nationally-recognized allergists even listed as inventors on some of the patents for these genetically engineered proteins . Because no tests have been developed to assess the safety of the novel proteins and allergens created in the biotechnological process of genetic engineering, governments of developed countries around the world have exercised precaution and either did not allow these novel proteins into their food supplies or required their labelling so that consumers, especially parents, could make an informed choice when it comes to feeding their loved ones. In the United States, that precautionary measure was never taken, despite the fact that human trials had not been conducted to assess the safety and allergenicity of these novel proteins. Because I could not unlearn that information or that of the financial ties between some of our nation’s most trusted pediatric allergists and big corporations and felt it important to disclose this information in order to inspire and inform parents and caregivers about ways in which they could begin to protect their children with food allergies, autism, ADHD and asthma, I founded the AllergyKids Foundation and wrote The Unhealthy Truth. And while I am trying my hardest to affect change, I can’t do it alone and appreciate everything that all of you are doing to inspire a health revolution for our children. Because, together, we can affect remarkable change in our food supply, not just for the little kids, but for the “big kids”, too. Mrs. Q here — I first “met” Robyn on Twitter and was inspired by her story. I am grateful to Robyn for contributing this guest post and she is giving away three copies of her book to readers of the blog. If you would like to be entered into the giveaway, leave a comment below! There has been a troubling increase in the prevalence of Celiac Disease (CD). Certainly, there is a genetic component, but is there an environmental one too? A 2009 “study, published in the journal Gastroenterology, found young people today are 4.5 times more likely to have celiac disease than young people were in the 1950s.” By one measure, cases are doubling every fifteen years. Something is causing this increase, and I’m betting it’s something we’re ingesting. According to a handout provided by the University of Chicago Celiac Disease Center, 1 in 133 people have Celiac disease, 1 in 56 with related symptoms (meaning if you have intestinal complaints). Interestingly, only 35% of people with CD had chronic diarrhea and 60% of children with CD were asymptomatic, which means many people are living with an auto-immune disease and they don’t even know it — though they may have other subtle problems that they wouldn’t attribute to their diets. What does “auto-immune” even really mean? According to womenshealth.gov, auto-immune diseases occur when “body is unable to tell the difference between itself and [a foreign body].” Then “the body makes auto-anti-bodies, which attack normal cells.” The site goes on to state that autoimmune disorders affect 23.5 million Americans and are the leading cause of death and disability. That’s big. Unfortunately, rates of CD diagnosis don’t seem to be keeping up with the increase. Many doctors still consider Celiac Disease to be rare. According to the University of Chicago Celiac Disease Center, 97% of people with Celiac disease are undiagnosed. Three million Americans have CD. Compare that to two million Americans with Alzheimer’s. Although gluten-free living is getting more press than ever, Celiac disease doesn’t seem to make the rounds in the media. With a grandfather suffering from Alzheimer’s-like dementia, I know the toll it takes on a family. But with Celiac disease, many people suffer in silence. It deserves more attention. Making a diagnosis is tricky. If a person tests positive through the blood test, that person most definitely has Celiac disease. But if someone has a negative result on the blood test (1 out of every 4 people with CD), that person might still have Celiac disease. Only an invasive biopsy confirms the intestinal damage associated with CD. Researchers are also finding that the number of elderly with Celiac disease is on the rise. So even if someone tested negative in the past, they may actually develop it later. In spite of the challenges in diagnosing Celiac disease, I believe that screenings for CD should be happening way more often. Some propose testing anyone with any auto-immune disease even if they have no intestinal complaints. At the very least there needs to be more screening and testing. On a personal note, my great-aunt, my grandmother’s sister, has Celiac disease. It was diagnosed in the 1990’s. I guess she was in her early 70’s at the time. Everyone in the family just shrugged it off — no one thought that anyone else in the family should get tested even though there is a genetic link. I’m pushing for my grandmother to be tested because of some health problems. Until this happens, keep the secret. Chef Boyardee Big Beef Ravioli. Just don’t tell them. 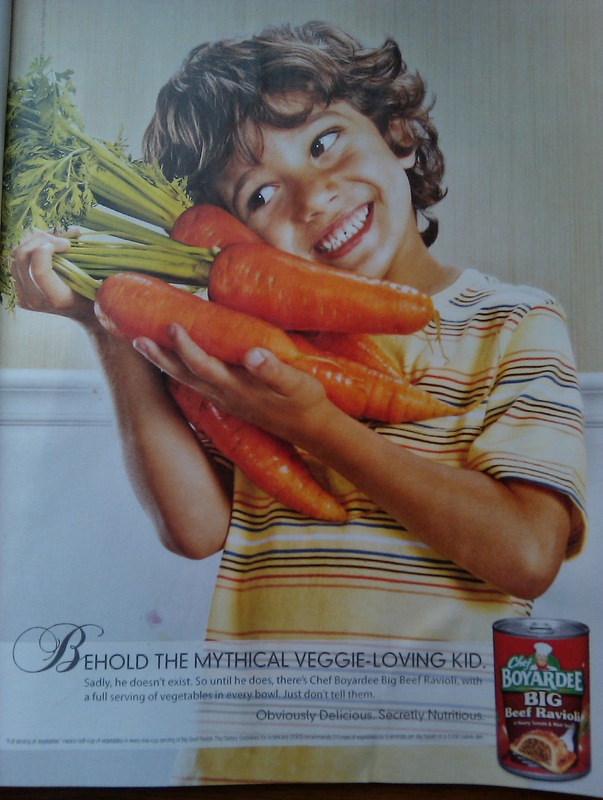 Behold the mythical veggie-loving kid. with a full serving of vegetables in every bowl. Just don’t tell them. Those are some cute kids with some massive veggies! Any kid who can’t read will see these and not notice the can of Chef Boyardee. 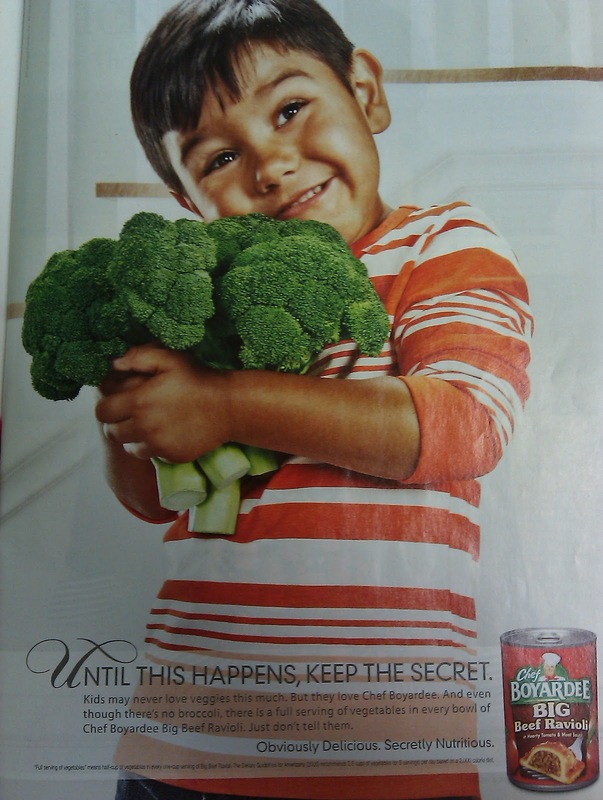 All they will think is, “Hey, if he hugs his broccoli and the other boy likes his carrots, maybe I should try some.” This is exactly the type of veggie advertising we need, minus the Chef Boyardee stuff. I think the choices of “broccoli” and “carrots” in the ad are a bit off. Sure, many kids don’t like broccoli, but carrots? Carrots seem pretty popular with kids. I’m sure that the Harvard MBAs who wrote and designed this ad researched which veggies they needed to feature. If the kid was hugging kale, now that would be surprising. What veggies does my son hate? Well, cooked kale and raw spinach. But overall I find that it varies by the day. Sometimes he’ll eat a few cubes of potatoes, other times he won’t, and then another day he’s eating them again. He went through an I-love-broccoli-must-eat-it-every-day phase, but now that love affair is cooling. I have to be careful not to over-offer. For example, one Sunday he ate a massive breakfast (a whole cup of yogurt, half a waffle with syrup and probiotic juice) and just two hours later a semi-large snack of half of Mommy’s KIND bar. Then at lunch he barely ate anything, but had fun playing with teeny-teeny sandwiches. I tried not to stress about it and not push food on him. His eating depends on how much he ate at a previous meal or snack, how he is feeling and if he is teething. (Before having my son, no one warned me about “teething.” Well, that sort-of blindsided me!) I find what he refuses to eat is usually not about the food, but all about his attitude! One time my husband was clearing the table after dinner and casually took my son’s plate away, saying “I’m going to feed the rest of this to the dog.” My son screamed, “Nooo!” and grabbed the plate back to eat the last two bites. We were stunned by this and once we recovered, my husband decided this was a great way to get my son to finish, or at least eat a bit more of, his dinner. So at dinner when we think that he could benefit from a couple extra bites (this happens maybe twice a week) and we’re cleaning up, we tell our son that his food is going to the dog. He freaks out and eats a bit more! It’s probably not what the experts would recommend, but it’s a useful little trick!